Here in Fort Collins, the town as a whole is no stranger to alcoholic indulgences — after all, the town has nearly two dozen craft breweries! However, before you head to the next Fortoberfest, Colorado Brewers’ Festival, Tour De Fat, or any of the other festivals dedicated to boozy beverages, make sure you know how alcohol affects your teeth and oral health! As your Fort Collins dentists, we want you to be able to enjoy the drinks you want without risking the health of your teeth and gums. 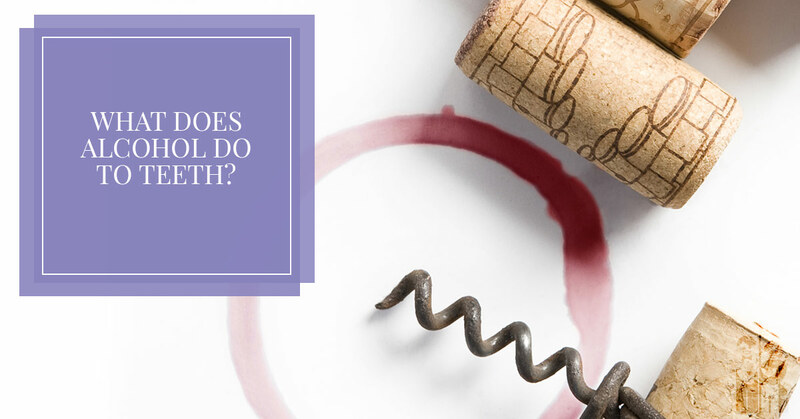 In today’s blog, we are discussing just what alcohol can do to your teeth, as well as how to indulge while reducing potential risks to your oral health. Keep reading to learn more! Teeth staining is perhaps one of the most common side effects of alcohol consumption on your teeth. Alcoholic beverages are acidic which causes the breakdown of tooth enamel, the hard protective layer on the surface of your teeth. The colors in alcohol, called chromogens, latch onto the softened enamel and remain there until you undergo a teeth whitening treatment, and even then may not fully lift from the enamel. This is especially common for those who enjoy red wines or dark beers. Many alcoholic beverages are high in sugar which feeds the bacteria in our mouths that cause tooth decay. Along those same lines, those who indulge in a couple drinks at night are more likely to go to bed without brushing their teeth to remove sugar and food particles, leading to more opportunities for tooth decay and cavities. Alcohol consumption is linked to gum disease for several reasons. Heavy drinkers are statistically more likely to not follow a strict oral hygiene regimen, and even occasional alcohol can be corrosive to the soft gum tissue, making a person more susceptible to gingivitis and periodontitis. Perhaps the most alarming connection between alcohol and oral health is that heavy alcohol consumption (defined as more than one drink per day for women and more than two drinks per day for men) is the second leading risk factor for oral cancer, right behind smoking. Those who smoke and drink regularly are at an even higher risk for the disease. This is one of the reasons why it is so important to visit a dentist every six months so we can check for early signs of oral cancer. One side effect of alcohol that has a major impact on your teeth is dehydration and dry mouth. Saliva is our body’s natural defense against cavities and tooth decay, as it washes away food and sugar (of course, this isn’t a foolproof defense and regular brushing and flossing are still necessary). However, alcohol is a diuretic, meaning it increases the amount of urine you produce which can lead to a state of dehydration. Make sure to drink plenty of water to accompany your alcoholic beverages. When people consume alcohol, they are often concerned about how they might act or who will drive them home — both very important things to consider! However, don’t forget about how alcohol can impact your oral health. As summer comes to a close and we approach the holidays, make sure not to neglect your oral health when you consume alcohol. Alternate drinks with plenty of water to wash away acid and sugars that can harm your teeth, drink through a straw when possible, and be sure to brush and floss your teeth before you go to bed. And, of course, schedule a checkup at your Fort Collins dentist every six months where we can check for signs of oral cancer and gum disease, as well as scrape off any plaque that might have built up since your last visit. Call our dentist office in Fort Collins today to schedule an appointment!